When you notice one of your fish is displaying sickness symptoms, you need to act swiftly to minimize the severity. Caught in time, most illnesses can be cured. Goldfish don't get sick unless they are old, something has changed, or we haven’t maintained their environment properly. The reason for the sickness needs to be determined later, but first aid needs to be administered immediately to ensure your precious pet has the best opportunity to recover. Poor water condition is the usual cause of most diseases, so the logical first step is to change the fish’s water. This has the same affect as giving oxygen to a human patient. It doesn’t cure the disease, but it increases the oxygen flow which aids recovery. It may also eliminate the primary cause of the disease. There are dangers with changing the water. You must ensure the weakened fish isn’t shocked because the temperatures are too far apart, the pH values are too far apart, or the water contains chlorine or chloramines. Fish can be moved to water with a higher pH safely, but if the difference in pH is large I would still gradually introduce the fish to the new water over half an hour. Stress Coat® has the added benefit of replacing the protective layer over the fish which is usually damaged if disease has taken hold. Your water test kit should include tests for ammonia, pH and nitrates. Now that your fish is in pristine water, some sort of medication can be administered. You may not yet know what the problem is or, you don’t have the medication you need and can’t get any quickly. The second first aid step is to put sodium chloride, or as it is more commonly known, salt into the water. We are referring to sea salt, aquarium salt, cooking salt, plain salt, or any names that are given to un-iodised salt. 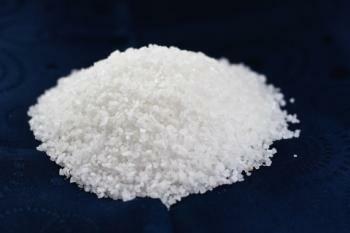 Salt for human consumption has iodine added because iodine is lacking in most diets. I buy 25kg sacks of swimming pool salt that is used in pool filtration systems. Salt is the cheapest yet most effective medication for the treatment of Goldfish diseases, and will cure the majority of ailments. Even if it won’t cure a disease such as flukes, it still boosts the immune system, and stops secondary diseases such as fungus which is often caused by flukes. Salt is the forth essential item in your first aid kit. After testing your water, you may have found the cause of the problem; low pH, nitrates too high, or ammonia is present. If this is the case, the pristine water and salt will more than likely cure the problem. If the problem is parasitical the pristine water and salt will buy you a little time until you can obtain the right medication, usually a Praziquantel based medication. Praziquantel is the fifth essential item in your first aid kit. The last essential item in your first aid kit is a sick bay. It doesn’t have to be an aquarium with all the accessories, just something that you can use to treat an individual fish in. Well, I thought there would be an update with some good news about crystal clear water...but not so. Essentially nothing has changed in my two test ponds. One is lightly populated with fish and the other heavily to see if there was any difference in the results. I will have to change the water in these ponds now and start again. I still feel Splosht is a good alternative after reading feedback from customers that had a similar lack of success with other chemicals. I will re-test my pond water now it has started to warm up. The temperature when I started the test was at the very bottom of the recommended minimum temperature.